What does DARPA and Facebook have in common? A couple weeks ago Stefanie Tompkins, DARPA acting deputy director, visited University at Buffalo to give a talk and meet researchers. She talked about DARPA and funding opportunities at DARPA. I had the mental image of DARPA as a slow moving, hard to maneuver aircraft carrier, but her talk painted a very different picture, and partially changed my perception of DARPA. DARPA, then ARPA (Advanced Research Projects Agency), was created in 1958 as a response to Sputnik 1. DARPA's mission is to prevent strategic surprise, avoid another Sputnik moment. And as you already know, the best way to predict future is to invent it. So DARPA is perpetually pushing the envelope to invent the next strategic surprise and disruptive technology itself. DARPA has a large number of successes under its belt. Internet has its roots in ARPANET. GPS grew out of basic research on atomic clocks funded by DARPA. DARPA is also credited with several inventions in stealth, radar arrays, uavs, ir night vision, microelectronics, and materials sciences. DARPA funded several high impact grand challenges on autonomous vehicles starting back in 2004, which helped kick start todays self-driving cars technologies. DARPA also funded other grand challenges, including the network challenge (2009), and cyber grand challenge (2016). 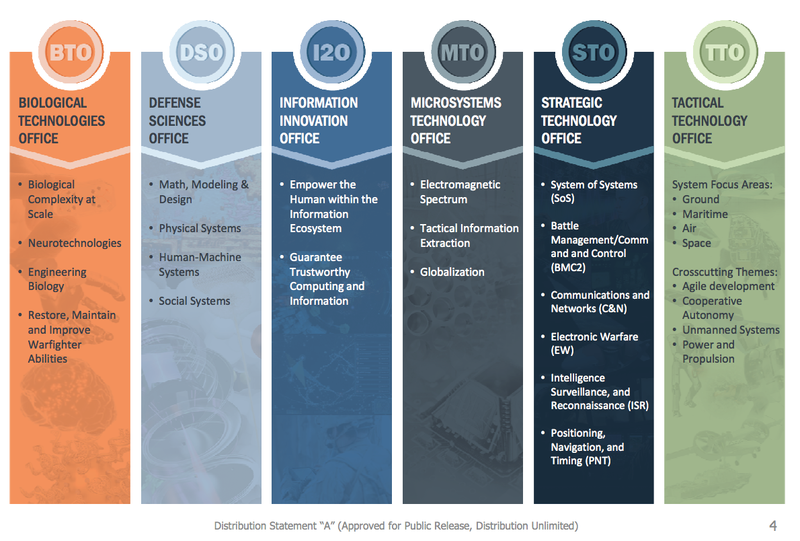 To drive for disruption and off-scale impact, DARPA recruits program managers from universities (20% of PMs) and industry. The program managers rotate quickly, they serve 3-5 years. Within that time, they use the budget allocated to them to create/fund DARPA programs on high impact research and development. DARPA programs may range from $10,000,000 to $400,000,000 over 2 to 5 years. 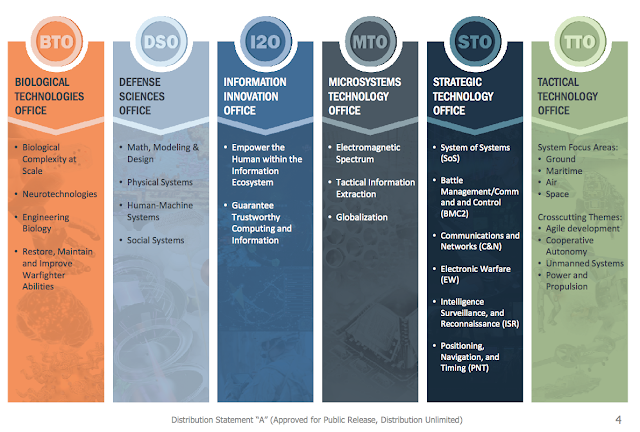 DARPA has 6 technical offices. Heilmeier questions have a significant place DARPA culture. Even the program managers need to answer these questions when creating new programs. Another part of DARPA culture is the infamous quadchart. "Quadcharts which cram in figures, assertions, and required logos/branding/acronyms are a proud and sacred tradition" (RT @tedherman).